I've been poking around for well over a week with these RF shields and accompanying USB dongle, trying to get temperature and humidity data recorded in a reasonable format. It's been a little frustrating but it's also been an opportunity to learn more about serial communication. I'm finally getting closer. I may actually have the data formatted better. Nothing seems to be getting lost in transmission anymore (previously words were being cut off). I did crash the Raspberry Pi last night with a python script I was running, so I've tweaked it and I'm running it again. Other than the crash, things seem to be moving in the right direction. I guess I'll know in a few days when I let things run, just to ensure there are no issues. 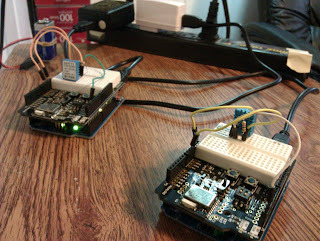 Hopefully all goes well and I can put these arduinos in different parts of the house.